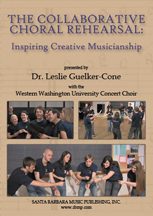 DVD: The Collaborative Choral Rehearsal presented by Dr. Leslie Guelker-Cone | Santa Barbara Music Publishing, Inc. Featured on this DVD are multi-sensory, student-centered rehearsal techniques that encourage the development of critical thinking and musical problem-solving skills. Incorporating a combination of kinesthetic, cognitive, and affective approaches, students make musical decisions about topics including choral tone, musical phrasing, thematic balance, dramatic intent, and poetic meaning. Using a variety of learning modalities results in more fully engaged students. This also produces stronger, more creative musicians who will be better prepared to become tomorrow's conductors, teachers, and music lovers.